Does Anyone know where Tommy Steele is present day? Tommy Steele - just like his famous namesake - has been singing to audiences for more than two decades. But, unlike the top entertainer, he hasn’t been performing to huge crowds at the London Palladium. Tommy is most famous for being Dorset’s one and only singing bus driver. He achieved national fame in the press and on TV and radio, after being stopped from serenading his passengers by his bus bosses. When newspapers spoke out on his behalf, a change of heart took place and Tommy was able to resume singing tuneful melodies on his routes around Bournemouth. Encompassing 21 years experience, this fascinating book is dedicated to bus crews and their passengers everywhere. The book describes what it was like to work and travel by bus, before one-man operation took away the camaraderie which existed between the bus crews themselves and sometimes even their passengers! Packed with anecdotes and personal stories about life on the buses, it will appeal to anyone who has travelled by bus and still has a sense of humour! Tommy says, "Why write books about being on the buses? I said books, because when I started my training as a conductor, a member of staff said I should write a book about the job, as nobody really knows what it is like to drive a bus. So, I started a card index of stories – both humorous and sad – of my experiences as a conductor, crew bus driver, then a one-person bus driver and coach driver. As the number of entries in my index increased, I began to realise that instead of a single book, I had enough material for an omnibus. As I write this, in front of me is a copy of the Bournemouth Daily Echo of Thursday 10 August 2000. One headline reads, ‘Wilts & Dorset cannot run a full service because of a shortage of bus drivers, despite offering over £6 per hour!’. Why? Turn to the ‘Letters’ columns of the same newspaper and you will read ‘Bus Ride to Hell!’. Let me take you dear readers back to the FUN days of bus driving!" Tommy is President of the East Dorset Speakers Club and Speaker of the Year, enthralling audiences all over the country with his recollections. 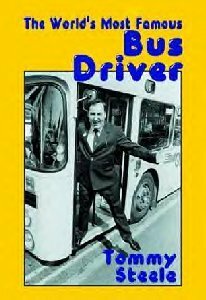 His talk ‘It’s only the passenger that runs on time’ is very funny and deals with the humorous side of bus conducting, bus driving and one-man operations (a lot of stories not in this book). His speech ‘Taken for a ride’ deals with the funny side of coach driving and even includes what coach drivers think of their passengers! During and after my speaking engagements my talk entitled "It’s Only the Passengers That Run Late"
People often ask "How much was working ON THE BUSES like the TV series?" Reg Varney when asked by the fan club "Why was ON THE BUSES so popular" Reg replied "Because it was true to life"
Remember the time where the bus company were going to employ Women bus drivers and Stan was worried that his overtime would be cut and he wouldn’t be able to keep up the hire purchase payments. Remember how Stan and Jack planned to get rid of women bus drivers, altering the road signs for diversions. Then the lady drivers went the wrong way and hopefully would be considered unsuitable for bus driving. Unlike today, bus workers had to work a lot of overtime to earn a decent wage. (One of the reasons combined with unsocial hours why there was always a shortage of bus drivers and conductors.) You had to like the job to do it. Could you imagine Stan and Jack wanting to do any other job? Any Ladies reading this do please do not think I have anything against women bus drivers. In fact I loved them or like Jack, tried to. We had a lady bus driver who was a bag of nerves on the road shouting at motorists and Passengers. The company received complaints from passengers and conductors about her rough driving. The company were reluctant to take action due to a shortage of drivers, it was the peak weeks of summer season plus she had only just qualified and they wanted to give her a fair chance. On one journey a conductor remonstrated with her as he was trying to collect fares, but was getting thrown around on the bus by her erratic driving. She shouted "I’ve heard the talk in the canteen; you are all against women drivers. However her downfall came one day when she was on duty as a standby driver. Someone phoned in sick at short notice, so she had to take out a double-decker bus with an open top; it ran on the coastal route between Sandbanks and Christchurch Quay. Never having driven the route before and only done it once as a clippie she got lost and had to ask the passengers for directions. As most were holiday makers taking a tour in the open top bus they couldn’t help much. The conductor couldn’t help as he was a summer student and it was his first day on his own as a conductor. After many false turnings and cul de sacs she finally reached Christchurch, trying to find the quay she turned into what she thought was a road but was in fact a boat slipway. Stopping on the slope a few feet from the sea she shouted "Hang on I’ll back up" Let us of first said one of the passengers. The conductor lead the stampeded to get of the bus followed by all the passengers, then followed by the lady driver who had second thoughts about what she was attempting and thought it to risky. She then had to phone the Inspector and get the bus company to send out the breakdown lorry to pull the bus back up the slipway before the tide turned and water would rise up the slipway. After this incident the company had no choice but to return her to clippie duties with the view to retraining her at the end of the holiday season. On her first day back she ended up on duty as a clippie with me driving the bus. "I had no chance" she said "They were all against me. In the canteen this morning they were saying have you got that sinking feeling and a good driver would have gone down with the s hip." "Never mind" I said trying to consol her let’s have a good day together" So of we went on our route. After leaving West Bourne I reached Bournemouth Square a distance of four miles. A passenger got of the bus and said" Who’s collecting the fares?" "Give it to my conductor" I replied. "You haven’t got a conductor mate" "Probably upstairs" was my answer. "I was sat upstairs there ‘ain’t no conductor on your bus" Turns out she had got of the bus at West Bourne to buy a paper from the newsagents and I had driven of and left her. Had I gone without the DING DING" or perhaps the DING DING came from a passenger pressing the bell deciding he had been on a bus with her before and wanted to get his own back after finding him self disembarking at slipway on a previous bus journey. "IT’S A GREAT LIFE ON THE BUSES"
There is a happy ending to the story, at least for the bus crews and company. She meet a driver got married to him and they had two children. HOW ABOUT THIS.These are slips bus drivers filled in to report faults on the buses they were driving. Then it shows the replies the mechanics gave after examining the bus. M:Warning buzzer set to more believable level. M: Bus warned to straighten up, drive right and be more serious. D: Destination blind keeps humming. M: Reprogrammed destination blind with lyrics. D: Noise comming from instrument panel. Sounds like a midget pounding onn something with a hammer.